The company has emerged as a highly reliable Manufacturer & Supplier of Washing Machine Capacitors. The Washing Machine Capacitors, offered by the company, are known for their safety as well as long service life. The company ensures the proper packaging of the Washing Machine Capacitor and caters to several electronic companies as well as washing machine companies across the country. These are cylindrical case designed for use in motor run applications and are popular in Washing Machines. Element - Non inductive type, wound by high speed fully automatic controlled winding machines. Welcome To Vijayshree Electronics (India)Vijayshree electronics (India) had a modest begining in the year 1990 initially under the title of Nepco capacitors and later incorporated with present title in the year 1995, with BABU RAM GOEL as its founder, with manufacturing & trading in electrical products like Capacitors, wires, etc. under the brand name VIKTRON. by hardwork, determination & farsightedness the company make a remarkable success in the market. The company is growing in leaps and bounds by adding new products to its existing and catering to market needs spread all across globe. the assets of the company are the people it holds, who are always ready to accept new challengesand believe in the customer satisfaction philosophy. This has been an instrument in its steady and enviable growth during the last decade. 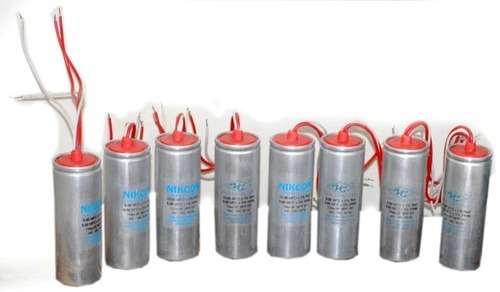 our we have a very wide range of all types of capacitors like ac electrolytic motor start capacitor, mpp film ac motor run capacitors, dual rating capacitors. washing machine capacitorsand we also deals in all and every type of capacitors raw materials.